It’s Tuesday, they’re all gone, and my beloved city looks like the same big-shouldered place along the big lake at the edge of what used to be a prairie than it did in the days before the eyes of the world focused on Chicago for the NATO Summit. The world leaders and their minions, the international cadre of journalists, and of course those thought-to-be fearsome protestors have left my town pretty much intact as we head from spring into summer. Not that they didn’t try. Alleged members of the mysterious “Black Bloc” group — reported anarchists bent on violence and destruction — did march a lot with the peaceful protestors and gave members of the Chicago Police Department a good workout as they scurried from block to block. And, tensions certainly were frayed Sunday afternoon as a small contingent of protestors tried to crash police lines near McCormick Place, the site of the Summit. But Chicago survived and now we can look forward to rubbing elbows with other visitors — like those who come here to shop, eat, take a boat ride and just enjoy the merits of a true American world-class metropolis. As a former newsman, I followed the events leading up to and through the Summit because, well, I like to know what’s going on. In my current position with a local real estate association, I had to know what’s going on in order to communicate updates to our members. On Friday, I took this image at the National Nurses United rally held in the Daley Center, a few blocks from our offices. 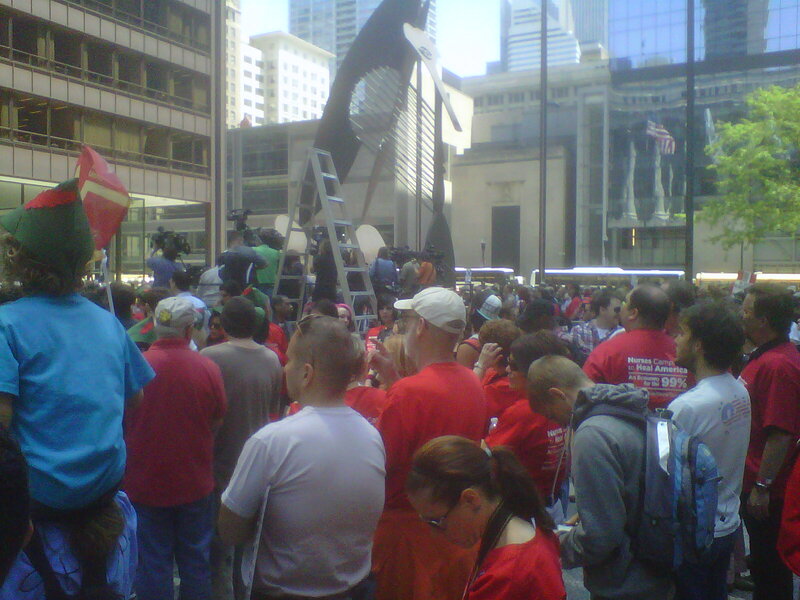 The National Nurses United rally in the Daley Center. That sculpture in the background was a gift from Picasso to Chicago. The weather was ideal, and for the most part the rally was an outstanding example of Americans exercising their First Amendment rights in a peaceful, respectful way. Then some from fringe groups marched and chanted, leading police on the first of many cat and mouse games that took place over the past few days in and around the central business district. I opted to head to the office Sunday — the day of the biggest sanctioned rally — to help with communications. If the near chaos that somewhat defined the 1968 Democratic Convention here was going to repeat, it would happen Sunday. As you may have read, it didn’t happen. 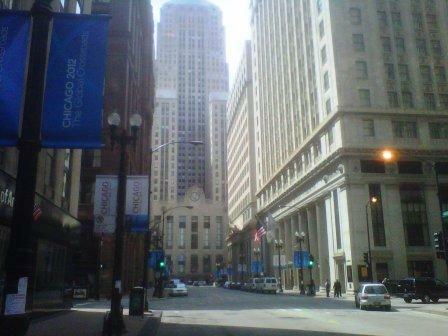 Below are a few shots I took along LaSalle Street, Chicago’s financial center, at midday on Sunday. A relatively serene scene. 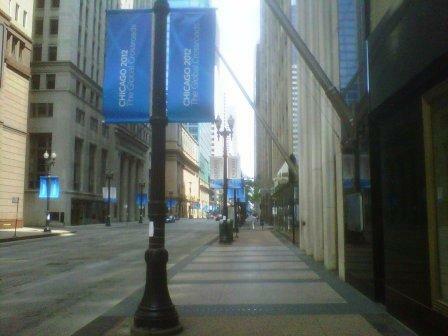 Looking North on LaSalle Street. Note the cool blue NATO Summit banners on the utility poles. To my knowledge, none sustained damage. Looking South on LaSalle Street, with the Board of Trade Building in the distance. Look familiar? “Batman: The Dark Knight” was filmed here! In the year or so since President Obama announced Chicago would host the Summit, there were lots of people complaining about madness the event would cause. Not me. Great things happen only when you take risks and face challenges head-on. Here in Chicago, the police, the business community and the people, were prepared. Some were inconvenienced and many businesses took a financial hit through lost revenues or extra security expenses. For a couple of days, Chicago danced on the world stage, and we looked pretty good. I kind of miss the drama, but glad to be back to normal. This entry was posted in Uncategorized and tagged Black Bloc, Chicago, Chicago NATO Summit 2012, NATO, NATO Summit. Bookmark the permalink.